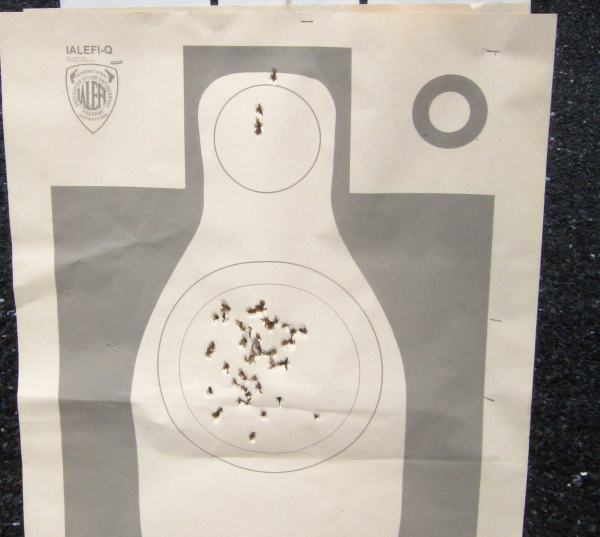 First, I’ve been shooting the GLOCK 43X and 48 pistols since the early part of this year. I find them both to be fairly well-mannered, with the longer, G19-ish length of the G48’s upper contributing to slightly kinder to the shooter than the shorter X-ray version. As a practical matter, I like the G43X better. It already fits most G43 holsters available (though we can’t say that for magazine pouches), it’s slightly quicker – but only very slightly – from the holster into the target. Maneuverability is superb and it’s harder for an attacker to wrest the shorter slide away when the gun’s already in your hand at the outset of the assault. The longer the lever, as Jim Lindell – creator of the outstanding Kansas City Handgun-Long Gun Retention and Disarming System – noted, “the greater the leverage.” Conversely, if I have more frame in my hand than slide in yours, that gives me an advantage. And it does make a difference. The cost is (1) shorter sight radius, which I discount immediately, and (2) more blast closer to the shooter. It’s still a small gun. The frame treatment on the SlimLine GLOCKs is more subdued, tamer than on the Gen5 series pistols – and you can tell that when you’re trying to grip for successive shots. Enter Talon Grip, a company now making their justifiably famous adhesive grip treatment for the G43X/G48. I got a set for both of the samples and, having already used the G43X for my annual ‘Geezer Qualification,’ I applied one to the GLOCK 48. It’s nothing new. Clear the piece – the sample, being here for T&E is always empty except when being fired, so I checked anyway. Then wipe down the grip frame exterior with an alcohol wipe – wherever you’re going to apply the tape-like grip treatment. I over-do it, really cleaning the surface of the polymer frame where the human hand interacts with it. Unlike field expedient grip roughening, like skateboard tape or getting out the soldering iron, the Talon Grip looks good. It applies easily and comes off without leaving stick-um everywhere. Talon Grip is thin, not changing the width or depth of the frame. It binds closely to the surface to which it adheres – provided you do your part and follow installation instructions. I start on the left side of the piece and work around, using the trademark cut-out as a reference point and smoothing it down as I work the tape-grip around the frame. I’m careful to ensure it doesn’t impinge on controls like the slide stop and either side of the magazine release button area. After application, ensuring there are no raised locations or ‘bubbles,’ I use a spare blow dryer to heat the taped frame. It should feel about like a hot cup of coffee. While it’s still hot, I final apply pressure all around making sure it’s stuck. Contrasting colors -- tan in front, 'safety' orange in back - helps ensure the holster mouth is clear when "looking the gun back into the holster." Below, the Talon Grip treatment and the slick BlackPoint Tactical holster contributed to the showing on the target. I was happy with the installation and the gun felt more ‘grippy’ than its unclad little brother. I coupled it with a new holster from BlackPoint Tactical, their OWB holster. This was a company I’d never heard of until I attended the SIG event before SHOT Show this year. BlackPoint was present as a sponsor and gave me a gift certificate for a holster. I selected the OWB for this gun because I had no dedicated holster for the G48. 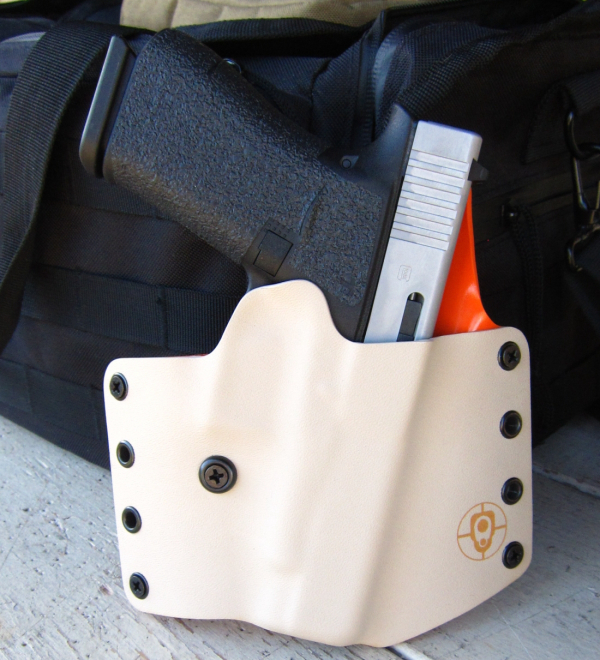 I specified a tan front piece and “safety orange” interior/back piece to the kydex holster. This gives plenty of contrast to ensure that rig is open and unobstructed when I go to reholster that pistol. I can see that there’s nothing in the way – unless there is. The website for the company shows lots of options – front and back colors, loop types, cant, additional loops, RDS cut, threaded barrel – both covered and open, as well as suppressor height sights. It’s all there. I put the holster on a belt from The Wilderness Tactical and used a magazine pouch from Safariland and headed out to the Sheriff’s range for a old-timer’s event. The ammunition I used was 147 grain FMJ match ammo. Using the GLOCK-supplied magazines I shot the course on an IALEFI-Q silhouette I stapled over the department’s (already shot up) standard “Q” target. The IALEFI-Q has scoring rings in the upper part of the “body” of the target and a “softball” circle in the “face” of the target. 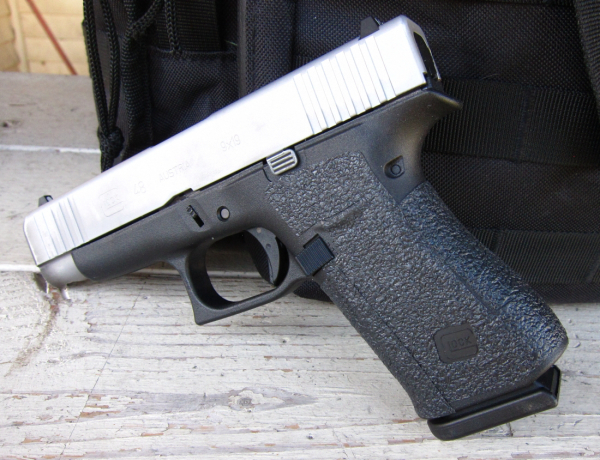 No question about it – the Talon Grip is an improvement over the uncovered GLOCK Slimline frame. I imagine the gun designer’s idea was to keep the gun, designed to be worn in close concealment, from being abrasive. The Talon Grip helped me lock in and easily clean the Q-course, keeping all the hits in the center ring except for the ‘failure drill’ head shots. I intentionally turned every 3- and 4-shot string into “failure to stop” drills, putting the last round of the string in the “face” of the target. One of those ‘leaked’ out of the head circle, so I’m saying I got a 98. The state would say I cleaned it. The holster is simply superb. It would do to take a class with and in casual concealment. If you ordered IWB loops and took the metal belt loops off the back, it would work inside the waistband. Can’t beat that. The Slimline GLOCK pistols are simply terrific. If you operate outside of the Free States of the US, if you’re sized such that double-stack guns are troublesome, if you have a need for closer concealment – or if you just like smaller handguns, the new line from GLOCK will fill the bill.